Do you think that you'll be more active here now? * No, I don't think so. 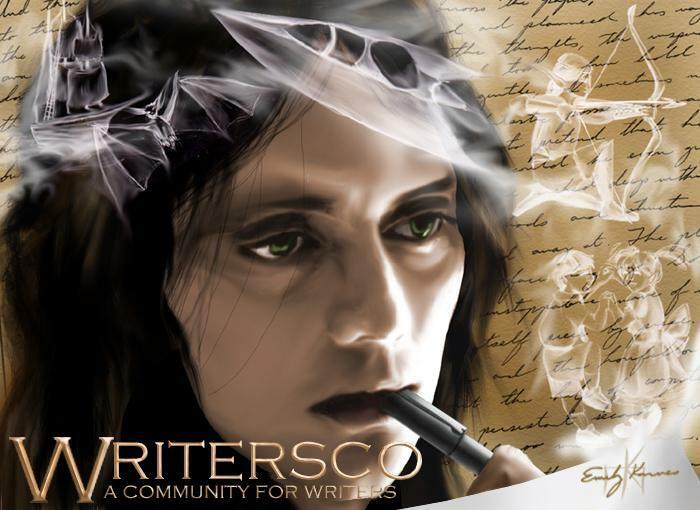 As the new community that overtook the address www.writersco.com (That this community had before) died out, this original Writersco is starting to come alive again. Look at the last posts in the forums and maybe message [hedda] if you want to help. NaNoWriMo is back. If you are not participating you should be! To get officially registered head over to nanowrimo.org and then head over to NaNoWriMo Support and track yourself against your fellow writers! From all the staff at Writersco we wish you a happy holiday and a very happy new year! Alright everyone, NaNo is almost here! If you are participating don't forget to join NaNoWriMo Support where you can keep tabs on everyone else participating, chat, log your success and failures and generally be counted in for the month of November. Also, November is the 30 Characters Challenge (also called 30 characters 30 days). registration is still on going if you can take five minutes of each day to participate. (www.30characters.com) This will have the new support page 30C in 30D Support. Please feel free to join, if you finish your NaNo early, coming up with 30 new characters is a breeze. As you all will remember, Fan-Fiction was banned all together when Writersco opened. This has changed and fan-fic authors may now post their writings on the wikis and link it to the official Writersco Fan-Fiction Database. Remember to follow ALL rules of Writersco and on the page, any writing that does not follow these rules will be removed. Owners are responsible for making sure that the Fan-Fictions abide by the originator's wishes. Hi everyone! Have you ever wanted to just chat with your fellow WC writers or get to know the community? We actually have two chat options! 1. You can have comment-style chats by following the "Chat" link on the top right side of WC. 2. You can join us at the embedded IRC chat on the wiki page Writersco Chat. Somebody is usually around. :) Hope to see you there too! As the previous crew have removed themselves to a private site with the intention of restarting WritersCo there, their current privs have been removed from this site. Hedda has given me siteboss privileges, and I intend to allow this site to go on as before. That said, 'before' seems to have killed the place, so if any active members have any suggestions, requests, ideas or events they wish to host here, go right ahead and send me a message, and I'll see what we can do to make it happen. As [Font] has changed so that www.writersco.com points to another site, all the links to your writings and other stuff here are now broken. You can thank him for that if you want. If anyone of you in charge want to keep using the site, it's OK with me. It isn't going to go away, but I'll not invest any time in it. Domain will be transfered within a few days. Looking into a new community format (Probably Joomla) - it may take a further few days to get it set up and organised. I can only stress at this point how important it is to save or delete any work you have on WritersCo. We will need volunteers to help out on the new site - so again please be thinking about what we need and what we can do. It's [WordFlower] for her splendid piece: 689.FiveWords.April-May! Go you! And now it's time to vote for your favourite Featured Writing of years gone by. Note: Some of the Featured Writings are for mature audiences, so I am looking for mature voters. It's on the left. Thanks, entrants! ... [pirate witch], with her drabble, 524.Contest Entries.March Drabble. Congratulations to all participants! Now go enter Five Words if you haven't. It's the first ever Featured Writing selection. Out of ten of the Featured Writings whose authors have been seen recently, you choose the best. Warning: Some of the pieces below are not family friendly, and are meant for mature readers, so I am looking for mature voters this time around. A poll is on the left side of the page. See you there! Gothic fatalism communicated in nonstop imagery. For they will again take life from you. Also see Featured Wriitngs and Nominated Writings. I know what I'm talking about, you know. I'm twenty-one years old. [Eleanor] combines a graceful word choice with both poetic and concrete imagery, to convey the gentleness of snow's ride down the sky and of its settling on the Earthly things below. NOTE: There is a new nomination procedure outlined in Nominated Writings.